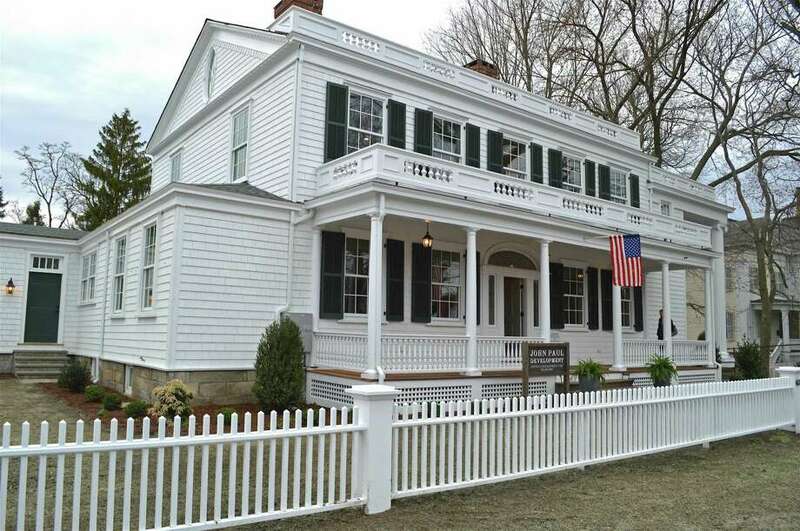 FAIRFIELD — While the new modernized interior might not appeal to all historic tastes, neighbors fervently agreed they were glad to see the Judge Roger Minot Sherman House — aka the Sherman Parsonage — still standing and ready for a new family to call home. John Paul, a Trumbull-based real estate developer, and his wife, Heather, held an open house Thursday evening at 480 Old Post Road, the 1816 house that in September 2017 was ravaged by fire and earmarked for demolition. “Nobody wanted to buy it and they’d listed it as a teardown,” said John, with records showing it was purchased last January for $500,000. He said his company, John Paul Development, invested an untold amount in repairs and renovation. “I’m going to be listing it for sale in the next couple of days,” he said, with a garage, several additional bedrooms, and a finished basement and attic added to the 200-year-old structure. “I don’t have a price yet,” he said, but the reaction by a number of real estate agents who were dropping by — as well as many area residents — would help determine that. Yet, John stressed that Thursday’s event was a chance to let community at large to see what had been done these past nine months since they began work. He said he had received 15 to 20 calls each day with people inquiring about the progress and asking to check out the inside. “I think a lot of people were emotionally interested in the house, so we wanted to give them that chance,” said Heather, a Realtor who also does work with her husband’s company. Much of the house was gutted by the fire, John explained, with the back entirely collapsing. “We had to redo the whole house,” he said, including reframing the outside. While the interior is largely tantamount to a new construction in design and accouterment, several historic touches were left in tribute, including some original beams and the bannister in the main entrance. “They’ve done a lovely job on it, but it’s very modern for a parsonage,” said Elizabeth Seavka, of Fairfield. “It’s sad that the integrity of the home wasn’t kept,” said Marybeth Barno, of Fairfield, referencing the 21st-century interior. For Lakin Hughes Schostak, of Fairfield, who grew up in the house as a girl in the late 1970s and early 1980s, the house had definitely changed. “It looks fantastic on the whole,” Schostak said, but vastly different, with the many secretive nooks and little spaces gone. Many things had changed as she and her childhood friend, Sara McEldowney Jannott, of Fairfield, toured it together, but the memories were still there. “The Barbie blowup furniture was on the bookcase,” Jannott noted as they entered one room. Schostak’s father, Paul Hughes, also stopped in to see the place. “It’s nice what they did with it,” he said of the house.